Well, hello there. I'm really excited about this mani I did last week. 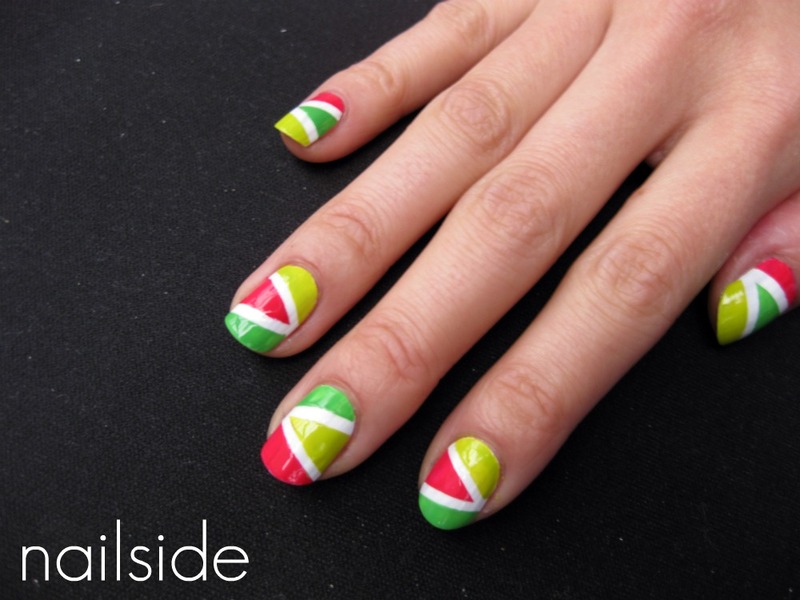 I wanted it to have its own name like a French or a skittle, so I came up with... the (taped) triangle mani. The colors I used are all from Essence: Everybody's talking about, Check me out and Lime up! layered over Essence's Stamp me! White. Together they really remind me of (cartoon) watermelons, so it's a fresh mani perfect for summer. The reason I used white as the base color is because the layering colors really pop that way. Also the layering polishes don't cover in one coat. But there's no time for a second coat, because for a neat result you have to remove the tape immediately after applying the layering color, otherwise the polish will stick to the tape and eventually come off with it. So we need the one coaters for this look! What I love about the triangle mani is how I can combine multiple colors on each nail. Here I used fresh, vibrant clours but of course you can use any colors you prefer. You could go for a more serious, dramatic look by using darker colors mixed with metallics. The possibilities are endless! So what are your thoughts on the triangle mani? Cute! This makes me wish it was summer...even though that's my least favorite season, haha. This reminded me of PAC MAN!